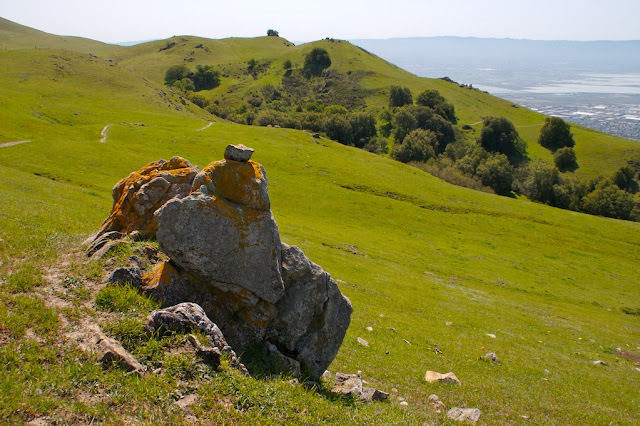 Mission Peak is a fixture of Bay Area hiking culture and attainable for most people with a little bit of effort. 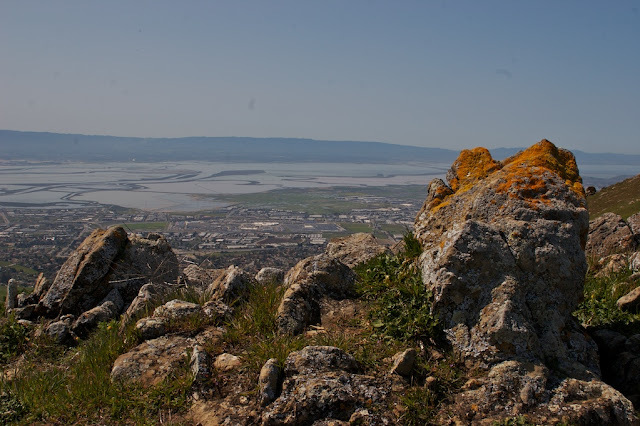 The summit offers some of the best views of any bay area peak with a phenomenal view of the south and east bay off its rugged west face and the beautiful and wild foothills to the east. 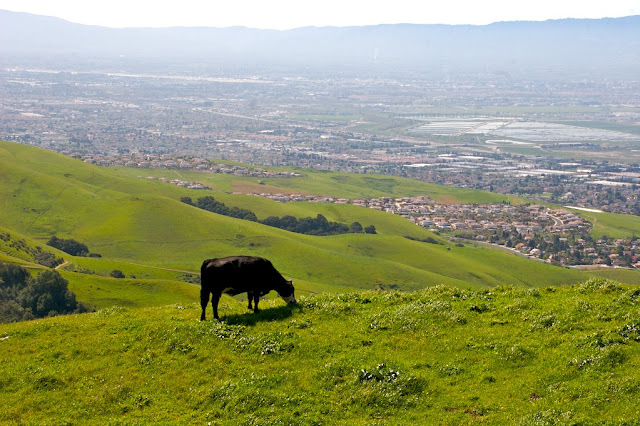 Because of its connection to other east bay regional parks wildlife flourishes near Mission Peak. It is not uncommon to catch a Coyote on the prowl or a Golden Eagle riding the thermals. 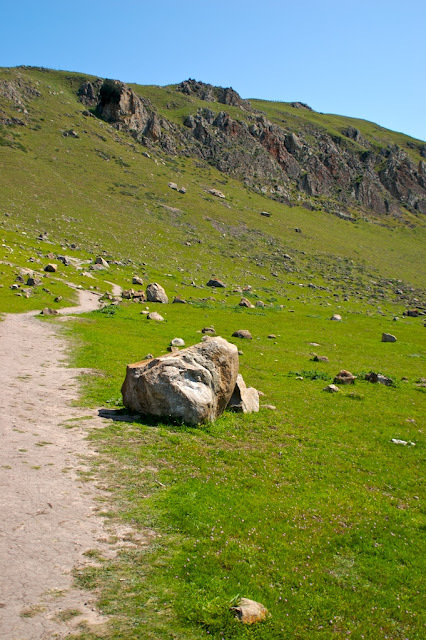 The Hidden Valley Trail, beginning at the Stanford Avenue Entrance, is the fastest and most direct way to the summit. Because of its beauty, its accessibility, and its prominence, Mission Peak is also immensely popular. Entering from Ohlone College provides a quieter and less strenuous alternative to the very popular and very steep Hidden Valley Trail. The Hidden Valley Trail traverses a gently sloped grassy field just outside the trailhead. 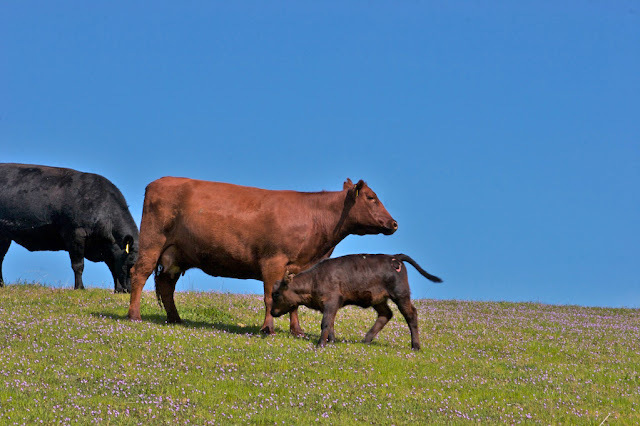 The East Bay Regional Park District uses cows, which routinely pay friendly visit to hikers on their way to the summit, to keep the grasses from growing too long and becoming a fire hazard. Mission Peak's rocky and rugged summit is constantly visible from almost all points on the trail. 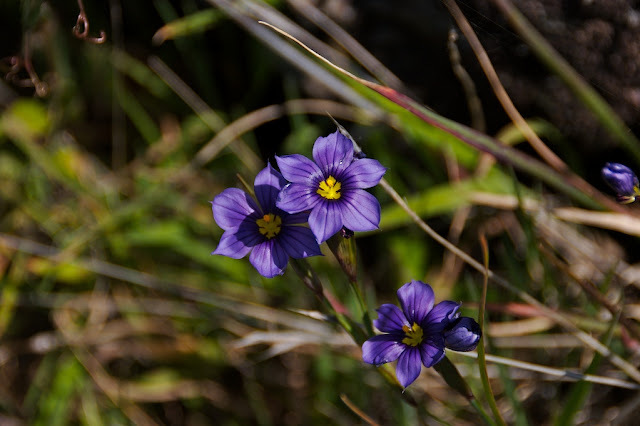 As the gentle grassy fields slowly give way to hillier terrain, and eventually steep trails and switchbacks, having the presence of the end goal above becomes a helpful motivator. Unfortunately as the trail becomes steeper, hikers start to pack in more. There is not much solitude to be found on the Hidden Valley Trail. The switchbacks eventually give way to a very cool boulder field below the summit, roughly 3 miles from the trailhead. A short, but steep (which is pretty much par for the course on the trail) walk past the boulder field leads to the first trail junction. 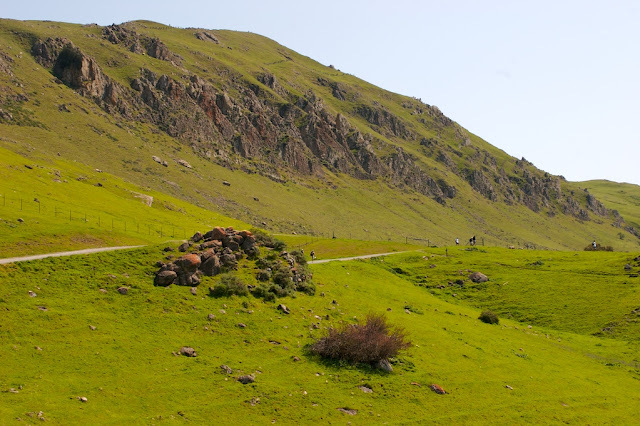 The route to the summit is obvious, bear right and keep going uphill through a series of junctions before starting the final push to the summit along the shoulder of Mission Peak. The bolder field below the summit area. The final mile is steep and rocky. I developed shin splints near the top ( a flare up from jogging earlier in the week) which slowed me down significantly. Fortunately though at least the crowds thin out considerably, at least until the summit area itself. Eventually the famous monument pole came into view marking the true summit. I set up shop on a pile of rocks nearby to have my lunch before trying to break away from the crowds (a large troop of boy scouts had made the summit pretty much unlivable for anybody else). 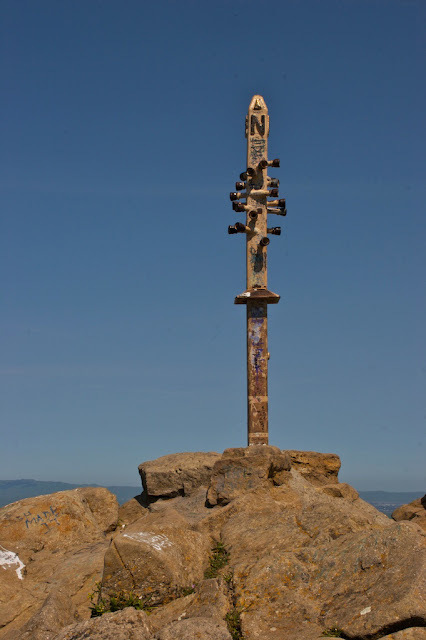 The Mission Peak monument pole. Instead of returning back via the main fire road, the slightly longer Horse Haven trail is a quieter, more peaceful alternative way down. From the summit keep heading across the ridge and towards the saddle with Mt. Allison (from the summit it is the peak covered in radio towers to the left). Horse Haven is more of a hiking trail and less of a freeway to the summit. It is much steeper, but for the return trip that suited my purposes just fine. Immediately my decision was rewarded almost immediately by a Golden Eagle sighting (fighting a red tailed hawk) just below the saddle between Allison and Mission. The trail descends steeply passing through a few cattle gates away from Mt. Allison after about a half a mile. I was warned by another hiker to keep to the left through a few deceiving junctions (trails to the right apparently lead nowhere, or back to the summit freeway). After a few rolling hills, Mission Peak throws one final challenge, a trail so steep that steps had been carved into the mud over the course of the winter. Finally the trail flattens out and arrives at a small creek and a final cattle gate before arriving back on the main trail for about a hundred feet and then dumping out at the trailhead. A little sunburnt from the highly exposed trail (even on a warmish spring day), tired, and out of water I worked my way another half-mile from the trailhead to where I had parked to wrap up a very enjoyable, and classic, Bay Area hike.